Its downtown reborn, its southern charm never lost – Greenville, SC continues to grow as a hot spot for commerce. Partner with Valpak of Upstate South Carolina for affordable direct mail and digital marketing solutions to help your brand’s message go further and reach your target audience. Every month, our Blue Envelope of coupons opens the doors to as many as 120,000 households in the Greenville area. Advertisers split the costs of reaching those households, so it’s affordable and effective. Using postal routes, income data and other factors – Valpak of Upstate South Carolina only advertises to the neighborhoods most likely to bring you business. Simply choose your advertising frequency – monthly or seasonally – and your print format: single-panel coupons, multipanel coupons, circulars, unique imprinting and more. Partner with a household name in direct and digital marketing, and work with a local staff that understands the area. Valpak of Upstate South Carolina can help you reach up to 130,000 qualified households in Greenville, Spartanburg, Anderson, Greer, Simpsonville, Easley, Greenwood and other nearby cities. For specific dates and coverage, contact your Valpak of Upstate South Carolina representative. 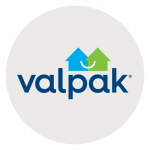 Valpak of Upstate South Carolina is an independently owned Valpak franchise.